The HR Solmitz Archive is a California public benefit non-profit corporation. 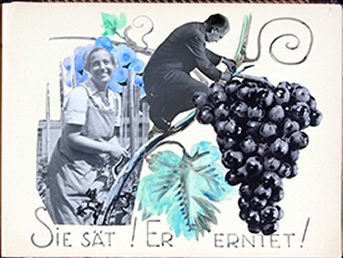 The archive consists of correspondence, clippings, diaries, photographs, artworks and other mementos accumulated by Hertha and Robert Solmitz during their lifetimes. 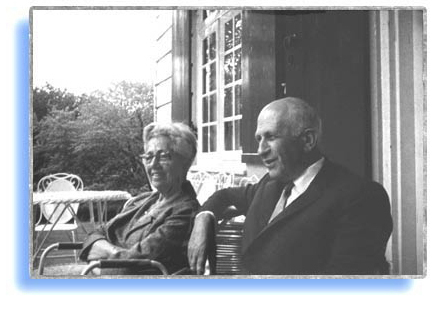 Hertha and Robert were both from Hamburg, Germany, descendant from many generations of prominent north German Jewish families. Collage from 'die Oase' by Elisabeth Hertz and Friedrich Adler. During the 1930s, after Hitler had come to power, their three children, their siblings (Hertha had six and Robert had two), Hertha's parents, numerous cousins and friends scattered throughout the globe. In June 1941, at almost the last possible moment, Hertha and Robert escaped NAZI persecution. They traveled by train through France and Spain to neutral Portugal. As soon as they were able, they boarded the ocean liner Serpa Pinto from Lisbon and crossed the Atlantic to New York. As they settled in the USA they began to save all correspondence with friends and relatives. After WWII they received a shipping crate with personal items sent from Hamburg to Switzerland for safekeeping. Currently archived materials are stored in Arcata, California. A few years from now these will be moved to Alexandria, Virginia.